The latest instalment of the promotional body’s There’s Nothing like Australia campaign uses virtual reality (VR), 360-degree footage to showcase the country’s aquatic and coastal experiences. On offer through the 17 films are a helicopter ride over the 12 Apostles, sailing the Whitsundays, swimming with sea lions and dolphins in South Australia, cruising Sydney harbour, snorkelling in the Great Barrier Reef, kayaking through Katherine Gorge and walking the Three Capes Track in Tasmania. Footage can be viewed using a Google Cardboard or Samsung Gear VR headset, as well as without a VR headset, and is accessible across multiple platforms including mobile. “This campaign has been designed to be incredibly immersive and capture what it feels like to be in Australia and to experience for yourself being on, in or near the water,” said Tourism Australia CMO, Lisa Ronson. Orchestrator of the techfest was creative and production agency, Finch, which partnered with VR and 360-content creation house, VRSE.works, along with Clemenger BBDO Sydney. Finch director of applied technology, Emad Tahtouh, described the challenge of capturing content for the campaign, as well as the volume of material, as the most significant and rewarding of last year. In total, Finch and Wrse.works captured 17 VR films, shot over 36 days. To get the job done, eight weeks were spent in pre-production, testing camera designs, techniques and technologies. Teams then built eight custom VR rigs, three drones, 41 cameras and a suite of software tools supporting the VR project. The Google Cardboard and Samsung Gear VR apps showcase the 360 footage in 4K. The Samsung Gear VR app also uses high-definition 4K renditions of the pre-loaded footage to showcase the 17 films. Alongside the fresh footage, films incorporate user-generated content from Tourism Australia’s social media fans as well as from partners, tourism operators and Sir David Attenborough’s Great Barrier Reef documentary. Tourism Australia flagged its intention to explore VR 18 months ago as part of ongoing efforts to be “the nation’s storyteller”, its former CMO, Nick Baker, said at the time. Other local brands experimenting with VR for marketing and customer engagement include REA Group, and Qantas. The immersive campaign was unveiled during a launch event in New York on Australia Day eve, and attended by Australian foreign minister, the Hon. 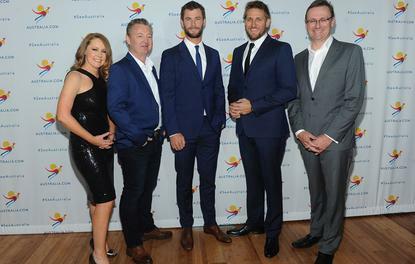 Julie Bishop, along with Tourism Australia’s latest global ambassador, Chris Hemsworth. 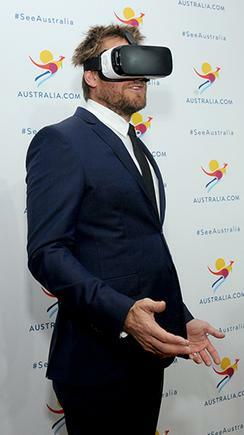 The event was hosted by Australian chef, Curtis Stone, and featured a specially designed Australian menu devised by celebrity chef, Luke Mangan. Other activities on the night at Bryant Park included VR displays, a digital aquarium and aquatic-themed images projected onto the park’s ice rink. According to Tourism Australia managing director, John O’Sullivan, 70 per cent of international tourists to Australia participate in an aquatic or coastal experience, making this content a vital part of how the country showcases itself to the world. The campaign also incorporates broadcast and digital assets and sits alongside Tourism Australia’s other marketing activities around food and wine and indigenous experiences.